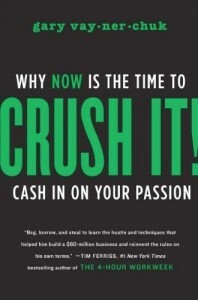 Crush It: Cash In On Your Passion By Gary Vaynerchuk - Book Review & Giveaway! Crush It: Cash In On Your Passion By Gary Vaynerchuk – Book Review & Giveaway! There have been very few books that I have read this year that have blown me away, much less changed the way I look at things. But, Gary Vaynerchuk’s new book, “Crush It: Why Now Is The Time To Cash In On Your Passion“ is an incredible and indispensible read for any entrepreneur, future business owner, blogger, or even the average internet user. You should read this book! I have been a huge fan of Gary Vaynerchuk for several months now since seeing his videos on YouTube, and his new book on personal branding and social media does not disappoint. Gary Vaynerchuck started out as a stock boy in his family’s liquor store, and eventually built the company into a $60 million business before moving onto trying to conquer the internet. Vaynerchuk exploded on the Internet 2.0 scene with his entertaining video blog about wine, Wine Library TV. If you just spend five minutes watching a video of Gary talking about wine, social media, personal branding, or marketing, you cannot help but be drawn to his incredible passion and charisma. I’ve tweeted about Gary before, and I said that he pumps me up every time I hear him talk. He is that good! Check out one of my favorite YouTube videos of Gary talking about branding and social media like Twitter. The Book. “Crush It“ is a very quick read. It only has 142 pages, but every single one of them is action packed. The book reads like Vaynerchuk talks, FAST! The book talks about how to grow you personal brand through patience, passion, and differentiating yourself from your competition. The book examines how to do whatever you love to do by using the internet and social media. I know that you may be thinking that you are too old, not technically savvy enough, etc. to learn from this book. But, like Vaynerchuk says, “What do you want to do everyday for the rest of your life? Do that!” You will learn something from this book about living the life that you always wanted…no matter what. The book talks about how anyone with enough passion and hustle can leverage the internet and social media to build your own personal brand and a business about any topic that you truly love. In the book, Vaynerchuk discusses what it takes to care about your users and customers, leveraging your DNA or your competitive advantage that makes you unique, incredible content, your marketing, the platform you choose to broadcast your ideas, creating a community, monetizing it, and finally leaving a legacy. Who Would Benefit From Book? Like Tim Farriss says about his book, “The 4-Hour Work Week“, you should only read Vaynerchuk’s book if you want to quit you day job and follow your passion. What excites you every morning when you wake up? Vaynerchuk says that is what you should do with your life. Do what you are passionate about and “Crush It”! People who want to learn about using social media like Twitter, Facebook, and other social media marketing techniques to promote a product or business will benefit greatly from reading this book. Gary’s passion is infectious, and you will not be able to put his new book down. I would also recommend it to people who are just getting started with a blog or website as well. Are you living or just earning a living? Gary Vaynerchuk is one of the most inspiring people you will ever hear speak. This book will help anyone who might find themselves even 1% unhappy with their work life. You will be inspired to jump into and be a part of the new Web 2.0 movement. You will learn how to harness the power of the internet with this book. That’s it. Easy, right? I’ll select one random winner on Sunday. He got me at PP. I loved his enthusiasm. The fact that he passionate and entertaining he has some very thought provoking suggestions. If I win the book great if not I will go buy it. Awesome! I came *this close* to buying it at Barnes & Noble the other day but thought I’d hit up Amazon first 😉 Since I’m lazy though I haven’t even done that! haha….so yes, enter me in! Been hearing great stuff about this book. I’m excited about this book! I appreciate the giveaway, so I subscribed. Great blog. Looking forward to winning. Just subscribed. Looking forward to checking it out. Thanks! Subscribed via email, Love Garry and Want his book badly. Thank you for the opportunity to enter. I like books. I like books that are free. I like to win. Just subscribed. Looking forward to what u have to say….. Credit @budgetsaresexy for me finding this!!! Congrats to Wojciech! He was selected by random number from Random.org for Own The Dollar’s first book giveaway. Make sure that you check back here often. This was the first of many future book giveaways. Thanks everyone for making this a big success.